Ten family members were killed and several others were injured when two passenger coaches coming from opposite directions collided with a Suzuki van on Sunday morning on the Indus Highway near Sann, police said. According to Senior Superintendent Police (SSP) Irfan Bahadur, two coaches — one coming from Sehwan and the other coming from Jamshoro — collided into the Larkana-bound van, sandwiching the vehicle. Police sources said that the accident occurred because the two passenger coaches were travelling at a very fast speed. 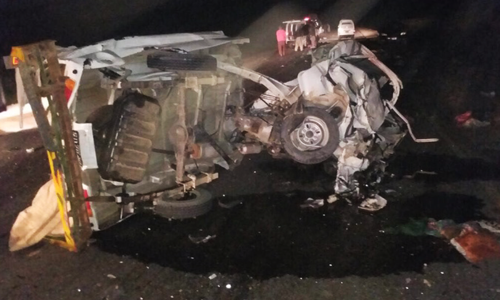 A man, four children and four women of a family ─ all van passengers ─ were killed in the accident and the van was completely destroyed, the SSP said. The bodies have been shifted to Sann Hospital. Some passengers on the coach were also injured in the accident, police said. The drivers of both coaches fled after the accident, the SSP added.